Inland fisheries are vital for the livelihoods and food resources of humans worldwide but their importance is underestimated, probably because large numbers of small, local operators are involved. Freshwater Fisheries Ecology defines what we have globally, what we are going to lose and mitigate for, and what, given the right tools, we can save. To estimate potential production, the dynamics of freshwater ecosystems (rivers, lakes and estuaries) need to be understood. These dynamics are diverse, as are the earths freshwater fisheries resources (from boreal to tropical regions), and these influence how fisheries are both utilized and abused. Three main types of fisheries are illustrated within the book: artisanal, commercial and recreational, and the tools which have evolved for fisheries governance and management, including assessment methods, are described. The book also covers in detail fisheries development, providing information on improving fisheries through environmental and habitat evaluation, enhancement and rehabilitation, aquaculture, genetically modified fishes and sustainability. The book thoroughly reviews the negative impacts on fisheries including excessive harvesting, climate change, toxicology, impoundments, barriers and abstractions, non-native species and eutrophication. Finally, key areas of future research are outlined. Freshwater Fisheries Ecology is truly a landmark publication, containing contributions from over 100 leading experts and supported by the Fisheries Society of the British Isles. The global approach makes this book essential reading for fish biologists, fisheries scientists and ecologists and upper level students in these disciplines. Libraries in all universities and research establishments where biological and fisheries sciences are studied and taught should have multiple copies of this hugely valuable resource. 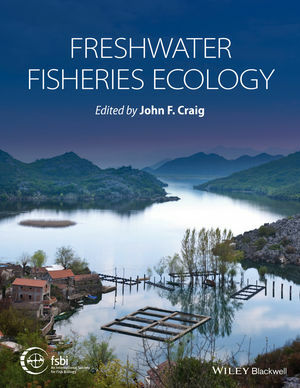 John Craig is Editor-in-Chief of the Journal of Fish Biology and has an enormous range of expertise and a wealth of knowledge of freshwater fishes and their ecology, having studied them around the globe, including in Asia, North America, Africa, the Middle East and Europe. His particular interests have been in population dynamics and life history strategies. He is a Fellow of the Linnean Society of London and the Royal Society of Biology.